Here’s an EP with two songs that are sure to take you back. Originally mixed by the legendary Larry Levan of the world famous Paradise Garage. These two Tracks were both considered anthems when played by Larry himself. Officially released in 1986, but this ‘’Demo Mix’’ of “Winners” was never released. Larry Levan played this unreleased cut for many years. 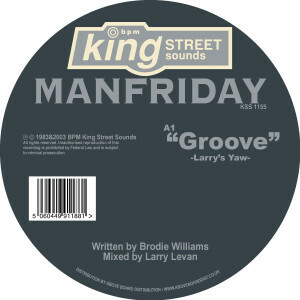 “Groove” was never actually released and it was Larry’s Secret Weapon! In January of 2003, both songs will be available for the first time together and are sure to bring back the nostalgia that has tried to be recaptured ever since. Written by Brodie Williams. Mixed by Larry Levan.